The TX321 is a GOES and Meteosat satellite data transmitter. 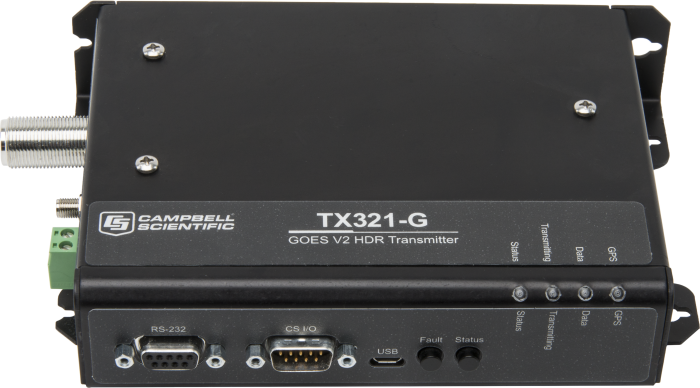 It provides an easy and reliable way for Campbell Scientific data collection platforms (DCP) to transmit data over geostationary satellites. 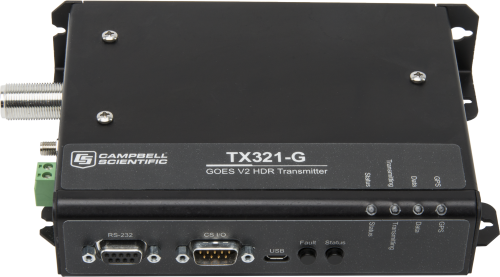 The TX321 is typically used by government agencies and sponsored research organizations for the purpose of collecting environmental data. The TX321 is designed for use on the NOAA GOES Data Collection System and the EUMETSAT Meteosat Data Collection Services satellite networks. These networks use geostationary satellites and ground stations to receive and relay data transmitted from remote data collection platforms (DCP), such as those provided by Campbell Scientific. These DCPs are typically owned and operated by government agencies and sponsored research organizations. Users are given a frequency and time slot for their transmissions. Following approval, NESDIS sends a Memorandum of Agreement (MOA). The MOA must be signed and returned to NESDIS. After the MOA is approved, NESDIS will issue a channel assignment and an ID address code. NESDIS must be contacted to coordinate a start-up date. Complete and submit the EUMETSAT DCP Admission form. When transmitting to GOES-13 or later, transmit EIRP shall be 37 to 41 dBm for 300 bps and 43 to 47 dBm for 1200 bps. Meteosat SRD transmit EIRP should be 43.25 to 52 dBm. CR300 The CR300 requires a null modem cable, pn 18663. CR310 The CR310 requires a null modem cable, pn 18663. ENC10/12R When installing the TX321 into the ENC10/12R, it must be mounted flat or a right-angle serial connector must be used, such as that offered by the SC12 or a ribbon cable. ENC12/14 When installing the TX321 into the ENC12/14, it must be mounted flat or a right-angle serial connector must be used, such as that offered by the SC12 or a ribbon cable. ENC14/16 When installing the TX321 into the ENC14/16, it must be mounted flat or a right-angle serial connector must be used, such as that offered by the SC12 or a ribbon cable. Typical power supply is a BP12 12 Ahr or BP24 24 Ahr battery, CH150 or CH200 regulator, and an SP10 or SP20 solar panel. The BP85 or a user-supplied deep-cycle rechargeable battery can be used if the system contains higher power consumptive devices such as continuous bubblers or heated rain gages. Note: Because of the peak power draw during transmit, do not connect to the 12V output of a data logger. This download is a zip file that contains new firmware v11.07 for the G6 radio internal to the TX321 and v8.04 for the G5 radio internal to the TX320. The file also contains the software package that uploads the new firmware and the TX321 / TX320 firmware update procedure. TX320 & TX321 USB Drivers for the Windows operating system. 32 and 64 bit support for Windows 8, Windows 7, Windows Vista and Windows XP. Note: Drivers should be loaded before plugging the TX320 or TX321 into the computer.